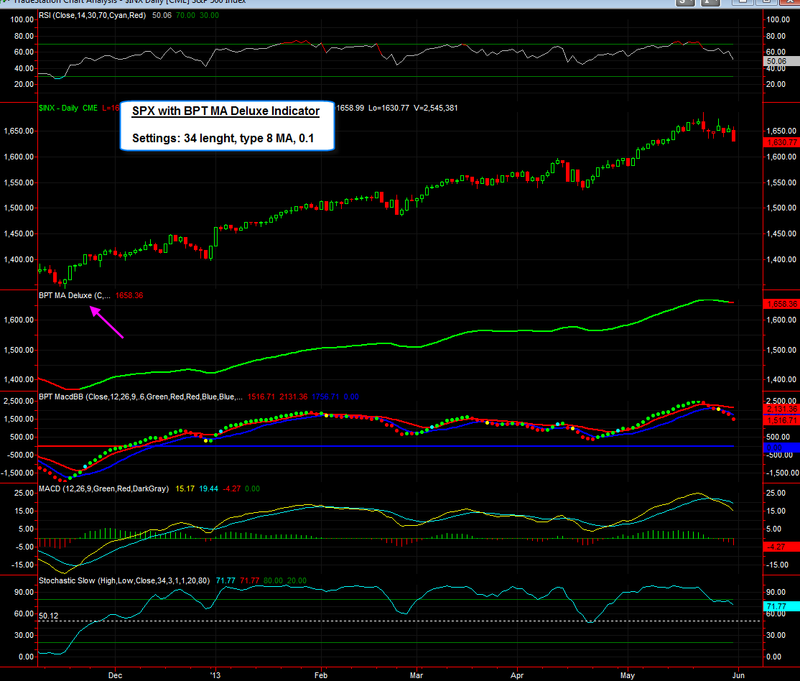 Here's the a daily and 60 min chart of the S&P 500 with the BPT MA Deluxe indicator, which I've shown before. As you know the 60 min version turned red on May 22nd, today the daily version finally turned red (it's been green since Nov 23rd). However remember this is NOT a system, its simply an exotic set of moving averages that that has a ton of settings that you can adjust. It is not a system and should always be used in conjunction with other analysis. 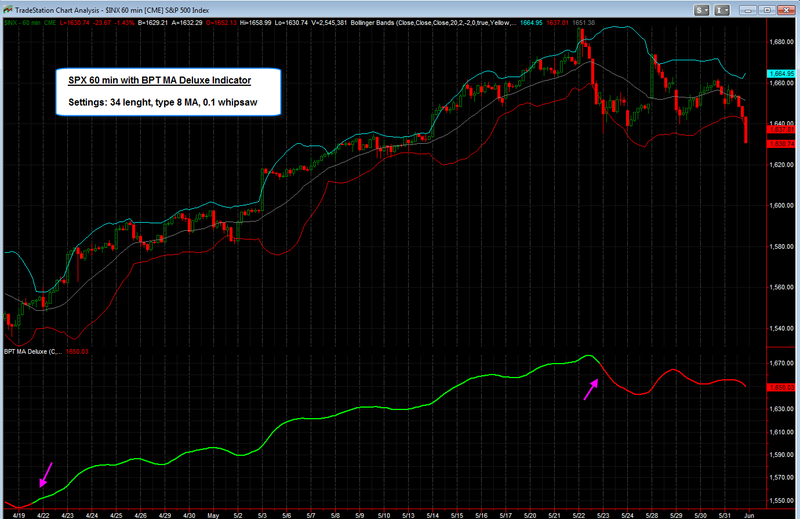 Also please be aware that this indicator has NOTHING to do with the SPY reversion to mean systems. Below is a write which discusses this MA set in more detail. Also note that as a BPT member you can get this indicator for free as well as these pre formatted workspaces, however you must have a Tradestation account and you must be a paying member, not a free trial member. The last custom setting it has is a whipsaw factor. You've all seen my use the BPT confirmation method where you need a second candle to confirm the first candle of an indicator change, I've shown this with various moving averages, MACD crosses, RSI above or below 50%, stochastics above or below 50%. However I added a whipsaw confirmation method to this MA that only allows the slope to change color if it is confirmed by a second color - this turns it into more of a trending indicator. I've attached some images below of daily and monthly S&amp;P 500 charts. The setting that I'm using is a 34 length exponential modified MA (our #8 MA) with the whipsaw confirmation turned on, as you can see it's done a great job at catching most of the trends. Again note that even though the indicator appears to follow trend very well, I still don't like to use it on its own, I use it as a tool with other things and analysis. For example on the monthly chart, I've found that whenever the RSI is oversold (which is a rare event on monthly charts), it's best to enter a long earlier than wanting for the MA to turn green - I've found taking the first MACD/BB green dot gets you in early (but only doing this when the monthly RSI was in a deeply oversold condition below 30%). The first three charts show monthly S&amp;P 500 charts while the last 2 charts show daily S&amp;P charts, one recent and while from the past.